When I began my genealogical research, I began in Tennessee and South Carolina with Southern American folk. I never imagined I'd run into anything quite like I did with the Norwood line, a well documented family of knights and English land owners that I became fascinated and fell in love with. I trace my lineage to the Norwoods via my 5th great grandmother, Elizabeth Norwood. She married George Yarbrough and they were the great grandparents of Alexander Yarbrough, my third great grandfather. In researching this branch of my family, their heraldry factors prominently into the pieces of their history that still remain. Eventually, I wanted to recreate an image of their heraldry and in doing so, began to research it more specifically. Although I began researching the Norwood de Sheppey heraldry, I quickly ascertained that there is no such thing as a family coat of arms. Instead, each individual family member achieves their own heraldry that is specific to them and their accomplishments. Thus, this wound up being a journey through the history of the Norwood Heraldry. For the purposes of framing the years of the research data within those of the surname Norwood and to identify the proper individual, where many have the same name, the following are the individuals that I identified from my geneaology research that are referenced in the heraldry research. Please permit me the leeway of posting these without sources as the sources are a mountainous pile of data that are outside of the scope of this post - and because their proof or lack thereof is immaterial in the heraldry research I present here, in large part, because heraldry is not for a family but for an individual. I have not had the pleasure of having a look at Marion Callam's book on the Norwood heraldry, which presumably would have covered all of this. Instead, I have opted to reinvent the wheel as accurately as possible. It should be said that there are people who devote a their lives or livelihood to recreating/creating heraldry or for whom heraldry are a part of their upbringing and they are steeped in the lore and ins and outs of correct heraldry design. I am not one of those. I am a Norwood, a genealogy geek and a research nerd. I've translated the language and images by doing some quick study of a few really great general heraldry resources. I welcome constructive feedback on the heraldry-specific technical details. Onward. I began with Crests of the Leading Families in Great Britain and Ireland by James Fairbairn. This book is considered to be a reliable authority on the subject and many of the sources that were available to me referenced this book. It is a delightfully straight forward book. The index lists families alphabetically and gives the plate and crest numbers and then the plates and crest numbers are depicted beautifully in the front of the book. This book included the following blazons (official heraldry descriptions) related to Norwood and Northwood. "Northwood, Eng. , a demi-lion, az. , armed and langued, or. PI. 67, cr. 10. Norwood, Eng., an eagle, rising, ppr. PL 67, cr. 4. Norwood, out of a ducal coronet, a boar's head and neck, all or. PL 102, cr. 14. Norwood, and Northwood, a demi-lion, rampant, erased, ar., ducally crowned, or, in gambs a branch of palm, ppr. PL 61, cr. 4." In The Norwoods I. An Introduction to their History, there is some information about the history of the heraldry which was helpful in narrowing down which crest was which as well as some of the other details of the heraldic achievement. In this book, Marion says that Sir Stephen de Northwode, the son of Jordanus de Sheppey, joined the First Crusade and took as his arms “a cross engrailed gules”. 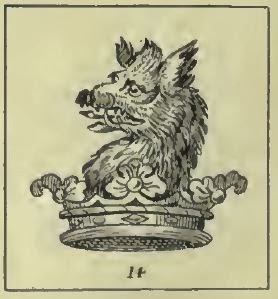 Stephen's son, Sir Roger de Northwode, added a crest in the form of a boar's head. The boar's head was carried on and was used by Sir Humphrey de Northwode when he became Lord of the Manor of Shalford in Essex in 1316. I was not able to confirm the information about Stephen and Roger. However, if they are accurate, Stephen would have taken these arms in his lifetime, between 1180 and 1231 and his son Roger would have added the Boar's head and neck sometime between 1240-1286. Marion says that the Dane Court Schools in Thanet took the boar's head crest of the Norwoods, who lived at Dane Court, as their badge. Low and behold, it can still be seen on their website here, correctly, with the head and neck and in yellow. I have seen rudimentary graphics of the crest, in which the coronet is technically incorrect, online. The Norwood heraldry specifies a ducal coronet which is distinct from a duke's coronet. They are distinguished by the number of strawberry leaves they have. A ducal coronet has three strawberry leaves and a duke's coronet has five strawberry leaves. The incorrect version of the Norwood crest shows 5 pointy bits on the crown . There should not be pointy bits, but if loosely interpreted to represent strawberry leaves, there should be three rather than five as there were no Dukes (that I know of) in the Norwood family. The correct depiction of a ducal coronet can be seen above in the boar's head (and neck) crest. "Norwoode, Sir John de - bore, at the first Dunstable tournament 1308, argent, a cross engrailed gules, a label (3) azure. Norwoode, Sir John de baron 1313 - bore, ermine a cross engrailed gules (a saltire in Jenyns' Ordinary); Arundel and Howard Roll; ascribed by ROGER in Dering Roll; See Monumental brass for Sir Roger 1361. Sir John of Kent, differenced with a label of three azure (F.); and another, ermine a cross patonce gules, Harlean Roll." According to my geneology research, the Sir John de Norwoode referenced above would have been the John who was the son of Roger and Bona. The Dering roll was created between 1270 and 1280 so the Roger mentioned in Some Feudal Coats of Arms who was listed in the Dering Roll would have been the Roger who was the son of Stephen and Joan. Sir John, son of Sir John and Joan Badlesmere (b1276, d1318) was born in Kent and so is most likely the "Sir John of Kent" referenced above. In heraldry speak, azure is blue and 'label of three' refers to the three crosses across the top of the shield pictured above, which is the shield of the "Sir John of Kent" referenced in the text. Although I cannot make out the first name above the shield, if Some Feudal Coats of Arms is an accurate account, this would be Roger de Northwode's shield, son of Stephen and John. The Parish Church of St Andrews, Shalford by Florence Law is focused more on the church that was on the grounds of Shalford Hall than on the family or manor itself. But the manor was held by the Nothwood family for some time and the church records their shield in several places, along with allied families, as was the custom of churches of the time. The mansion house of Shalford hall is south of the church now known as Parish Church of St. Andrews Shalford. In the church, are (as of the time that this book was written) several images of the Northwood arms. the history of the boar's head having been added by Humphrey, as told in The Norwoods I. An Introduction to their History. In the East windows of the church, there is a 14th century rendition of the allied family shields. In this window, there are three Northwood shields, Northwood of Shalford in the upper left, Northwood of Kent to the right and below that, and Northwood of Shalford in the lower right corner. Florence Law has this drawing of the window (below, right). There is a larger, color photo of the window at this site. The author of the site has labeled the Norwood of Kent shield as simply 'Norwood'. The Archaeologia Cantiana Vol.2 includes a few seals associated with the Northwood family and two of them include a familiar enough shield. Seals were not legal matters that needed court approval - they were more like unique signatures that each individual or family crafted to their own liking. The seal to the left was attached to the release and quit claim of in the manor of Thurnham of Sir Roger de Northwode. 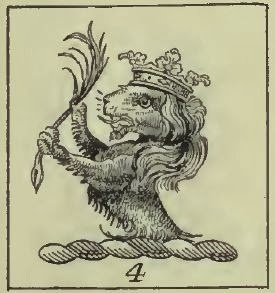 The text says, simply 'Sigillum Rogeri Northwode' - or Seal of Roger Northwood. This was the only seal I saw with a tree above the shield but I thought it was particularly beautiful. The seal pictured to the right was used by Joan (widow of Sir John) on her grant of Thurnham manor to trustees, dated 28 Jan 1397. The text around the outside reads "S dne Johne de Norwode". I'm unsure what "S dne" would mean. This seal was interesting to me because the shield is divided longways, in half with the left half having the familiar ermine a cross engrailed gules and the right half having what appear to be three bucks' heads, which is not symbolism that I have seen in any of the blazons I read or crests I saw. Joan's father's name, according to Archaeologia Cantiana Vol.2, in which the seal appears, is Robert Here. I have his name as Robert Hert or Hart from another source. There is a Hart seal that involves several bucks. If that is, in fact, her father's family name and crest, this seal looks to be a proper impalement (or impaled shield) with the male's family shield on the left and the female's on the right, which could actually be evidence as to her identity as John's wife and Robert's daughter. "The shield is large and hollow, and charged with ermine, a cross engrailed gules, for Northwode"
With the Crest and the Shield established, that leaves the mantle and/or any other pieces that might have been a part of the heraldry of family members. I have seen a statement about the mantle being "gules and ermine doubled"  which I believe (it's hard to tell from the page) is attributed to G. Marion Norwood Callam, The Norwoods II, Heraldry and Brasses but as I mentioned previously, I have not seen that book and in all of the documentation of the heraldry that I found, I was unable to find a published source for this information or a reference to the mantle. I did email the College of Arms, as part of this project, to inquire about getting a copy of an image or a description of the full heraldic achievement of a particular person. The York Herald responded quite promptly with an offer to research that for me for £310 (about $507). Not today... but maybe some day! And that's that! This was a really fun project for me. I have a collection of new images to go with my genealogy research, some new evidence and a world of new understanding about heraldry. Winning! Take it with a grain of salt and do your own reading over the sources I used, which are all available online and are kind of amazing in their own right. Law, Florence F. The Parish Church of St Andrews, Shalford. N.p. : Wiles, 1898. pp 21-48. Print. Kent Archaeological Society, Archaeologia Cantiana, Volume 2, Kent Archaeological Society., 1859. pp 11-42. Digital copy digitized Jul 27, 2007. Accessed from https://archive.org/details/archaeologiacant02kent 16 Dec 2013. Norwood Callam, Gertrude Marion. The Norwoods I. An Introduction to their History. A.E.Callam, 1965. Digital Version, digitized 2013. Fairbairn, James. Crests of the Leading Families in Great Britain and Ireland. 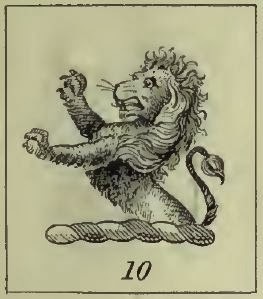 pp 61, 67, 102, 356 New York Heraldic Publishing Company, 1911. Digitized by The Internet Archive, 2007. Accessed 16 Dec 2013. Belcher, William Douglas. Kentish Brasses. pp 185, 187 London : Sprague, 1888. Foster, Joseph. Some feudal Coats of Arms. James Parker and Co. Digitized by Internet Archive. Accessed 16 Dec 2013. British Library Support and Grants. http://support.bl.uk/Page/Become-a-friend---grants. Accessed 16 Dec 2013. Fox-Davies, Arthur Charles. A Complete Guide to Heraldry. T. C. & E. C. JACK, 1909. Digitized by the Internet Archive. Accessed 16 Dec 2013. College of Arms. http://www.college-of-arms.gov.uk/. Accessed 16 Dec 2013. Hi, I've never seen a painting, I don't think. I'd be interested in seeing a picture of it. I Don't know that this is your John Norwood - it was a common name and there were a couple of biggish Norwood lines. Here are the most likely candidates from thta time from "my" Norwood line. John De Northwode son of Warden of the Cinque Ports Roger Northwode and Bona Fitzbernard was born on 24 Jun 1254 in Coventry, Kent, __________, England, died on 26 May 1319 in Isle Of Sheppey, Kent, South East England, England at age 64. John married Joan de Badelesmere The child from this marriage was John Sir De Northwode. John Sir De Northwode son of John De Northwode and Joan de Badelesmere was born in 1276 in Coventry, Kent, England, died on 8 Sep 1318 in Norwood, Kent, England at age 42. John married Agness Grandisson. Also Hi Carrie, I am sure we are distant relatives.